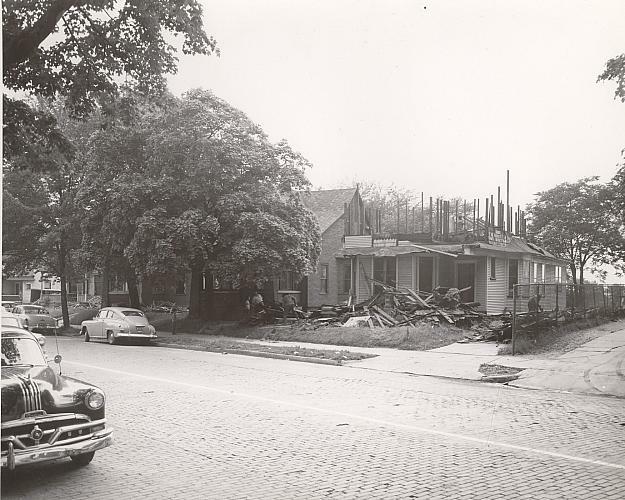 Wrecking crews just visible under a tree demolish houses on brick-paved Grandville Ave. One boy on the sidewalk and another near the workmen watch them. Another workman can be seen through the chain-link fence in the driveway of the house on the right which has had the second story removed leaving only the upright timbers and a pile of rubble in the front yard and the driveway. Late 1940s and early 1950s cars can be seen on the street including a 1949 or '50 Pontiac, with its telltale five chrome hood stripes, in the left corner. Title by cataloger. Noted on back, 6/9/5 looking SW. Stamped, Universal Studio, 1592 Plainfield NE, Grand Rapids, MI.